The Tampa Bay Rays are known for giving baseball its latest pitching trend — the opener. They were the first team to use relief pitchers to start games last season, something that other teams adopted and used even into the playoffs. 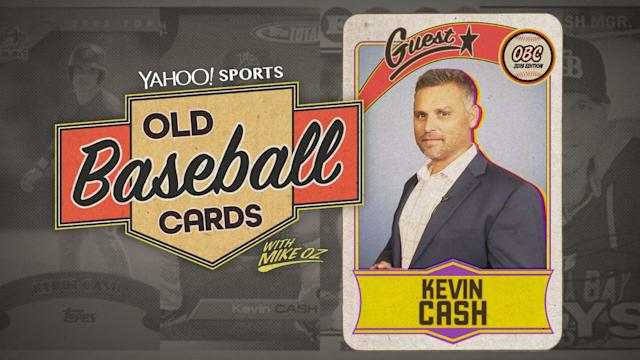 On this week’s episode of “Old Baseball Cards,” Yahoo Sports baseball-card driven nostalgia show, we’re making Rays skipper Kevin Cash a different kind of opener. A baseball card opener. Cash joins us to talk about his own baseball-card collection (he’s got some good ones) while opening packs of 1987 Donruss and 2004 Topps — the first is from when he was a kid, the second from when he was playing in the big leagues. We talk about Alfredo Griffin, Shawn Greene and then two guys who played in MLB forever: Jamie Moyer and Ruben Sierra, a solid 45 years between them. When it came time for us to make a trade, it was one for the ages. If you’re new to our show, we open packs of cards with baseball players, coaches and famous fans. It started with cards that my grandma bought when I was a kid, hoping they’d be worth a ton of money one day. Such is the junk wax era. Now, we we open cards from throughout the ‘80s, ‘90s and even into the ‘00s. Instead of chasing money, we’re chasing valuable stories, memories and good ol’ baseball nostalgia.